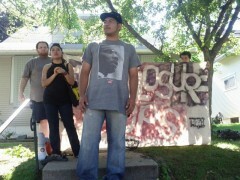 Occupy Homes MN protesters charged with third degree riot for defending Cruz home from foreclosure | Fight Back! Minneapolis, MN - The Minneapolis City Attorney is ramping up repression to try to stop the months-long campaign to resist the foreclosure of Alejandra and David Cruz’s family home at 4044 Cedar Avenue South. In an ominous development, at least three of the dozens of people arrested in defending the home from foreclosure are now being retroactively charged with third degree riot, obstructing legal process, disorderly conduct and presence at an unlawful assembly, in addition to their original trespass charge. The third degree riot charge alone could mean a year in jail and $3000 fine. For several months, Occupy Homes MN has mobilized hundreds of people to occupy and defend the Cruz home while building pressure nationally on PNC Bank, demanding that they negotiate to allow the Cruz family to keep their home. The Minneapolis police repeatedly returned to the home to try to dislodge the occupiers and were repeatedly rebuffed through mass civil disobedience. After the police finally succeeded in ejecting the occupiers and locking down the home, there was a mass civil disobedience action on June 21, where 13 more people were arrested, including hip hop artist Brother Ali.